If the power light flashes rapidly and nothing else happens, this document may help you. This info is primarily for the Technika LCD 19ID107, Which is sometimes misread as 191D107. I decided to trace the fault and write this "How to" as I could not find this info anywhere on the net. All the info in this page is copyright to me as I spent time working it out. Don't plagerize my site, link to this page instead. This fix should work if your TV's standby LED light just flashes when the it is plugged into the mains and the TV won't do anything else. Diode D102 (VF20100SG) and/or Resistor R110 (5.1 ohm) are probably blown. Treat them as a pair, if the diode is blown you should replace the resistor too, even if it tests ok, as it will have taken a hit when the diode blew. Lay the TV face down on a towel (to protect the screen) with the stand hanging off the bench. Remove the screws that are in a rectangle shape near the stand, then carefully slide the stand out by pulling it towards you, making sure that you don't pull the whole TV off the bench. Once the stand is removed, remove all the screws from around the case of the TV. Do not remove any screws from any of the sockets or fittings on the metal plate, they do not need to be removed to get the cover off. When all screws are removed, gently lift the cover off... noting that you will need to lift it up slightly, then pull it towards you so that it can clear all the sockets and stuff. Now you should see the main board of the TV, with the section in the above photo being in the upper left quadrant. If you cannot locate what you see in the picture, then your TV has probably got a different revision of the board and this fix probably wont help you. You will need to be careful of ESD or "Electrostatic Discharge" when working on this board as there are some very sensitive components on it that may get damaged just by touching them if you have (unknowingly) built up some static electricity in your body. You could buy an anti static wristband, or more simply, make sure you ground yourself (by touching a metal tap in your house, or a radiator that is earthed) to clear the static before you start working on this board. Its a good idea at this point to take photo's of all the connections that you can see, as they all need to be unplugged and unless you got a fantastic memory (like me! lol), the photo's will help when it comes to plugging them all back in. You could draw a basic diagram if you do not have a camera handy... When you have "memorized" where all the wires go, start unplugging them. Now we just need to replace the Diode D102 (VF20100SG) and Resistor R110 (5.1 ohm). Yes, I know it looks like a Transistor, but it really is a Diode! The Diode is a three leg "High-Voltage Trench MOS Barrier Schottky Rectifier" to give it its full title. Removing the Diode is not the easiest of jobs because the transformer is in the way, so you cannot undo the screw holding it to the heatsink (unless you have a very clever L shaped screwdriver). Your options are A). Remove the whole heatsink and both diodes, or B). Remove the transformer to gain access to the screw. Since we also need to get to the Resistor, my preferred option is to remove the transformer, which gives the best access to both components. The resistor can be replaced with a standard resistor on wire legs or another SMD one if you can get one. 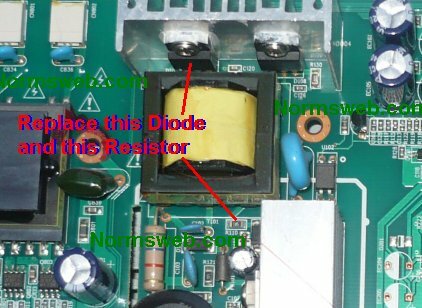 If the resistor is blown and you intend to fit a standard resistor in its place, then its a good idea to leave the blown SMD one there so the legs of the standard one have somewhere firm to solder to, but if you are fitting a new SMD one its best to remove the blown one first to get a better contact on the new one. Once the new resistor and diode are fitted, all you need to do is re-fit the transformer and put it all back together. Just reverse how you took it apart and you should now have a fully working TV again. Just repaired my lcd191-107, Spot on diagnosis many thanks.